Our Pine Street clients desired their penthouse to reflect their extensive eastern travels; we discussed the importance of maintaining a thread of continuity so that each space had a true sense of belonging. In this case we used deep, rich colors and bold textures throughout. Their master bedroom is a nod to the Middle East with vivid reds and purples and Moroccan-style custom furniture. A local craftsman book-matched Carrara marble to create a one-of-a-kind tub, shower surround and floor in the master bath. Venetian plaster was used to surface the groin vault ceiling and the arched vanity mirror. Another local artist created the custom medicine cabinet door which was embellished with an antiqued mirror and a laser cut steel grid of a Middle Eastern motif. Australian Jarrah, a dense & water impervious wood, works well for the custom toilet cover and guest shower shelves. Moorish lights were sourced in Turkey. Their kitchen is a reminder of time spent in the far east. Stunning African mahogany custom cabinets anchor the couple's main living space which has views to the Flatirons. Dark bronze oriental cabinet hardware, a black Franke fireclay sink and matte black granite counter tops balance the bold red walls in this room. Laser cut screen by Lightwave Laser of Santa Rosa, California add a unique pattern to the staircase, as well as several windows throughout the project. Step into Bali when entering the guest bath. 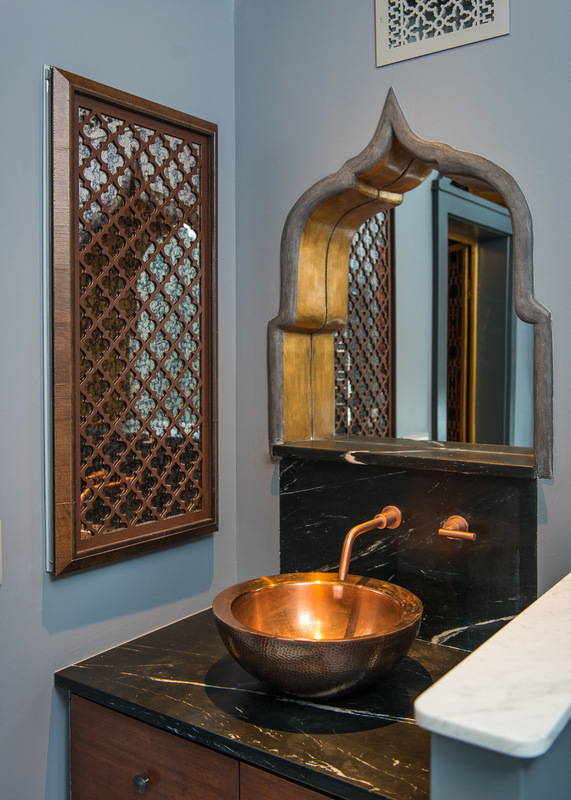 Stunning satin brass fixtures by Watermark adorn the room including the shower walls of stacked black slate. A simple matte black pedestal sink and smoked glass shower partition accentuate the authentic bamboo grass cloth walls. This completed project conjures happy memories at every turn for the homeowners; they plan to enjoy it for many years to come.